Brad Stevens believes the Boston Celtics have put their early-season issues behind them and was delighted to see Jaylen Brown have an impact from the bench against the New York Knicks. 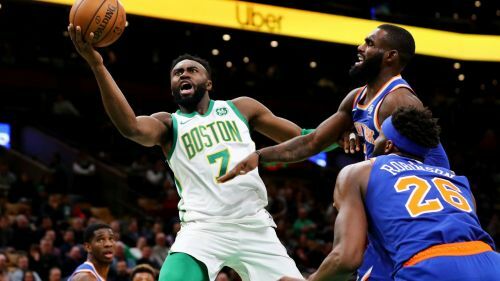 The Celtics (14-10) endured a difficult November as they lost eight games, but Thursday's 128-100 defeat of the Knicks was Boston's fourth straight win. Coach Stevens observed a complete performance as his side outscored their opponents in every quarter and he suggested his team have moved on from their tough run. He told reporters: "I think our guys are in a good spot from that standpoint. "I don't see some of the issues we had earlier in the season when I watch us play. There are things we have to fix, but we're competing at a good level." Brown was returning from a back injury and Stevens acknowledged his 21-point impact from the bench played a huge part in getting the job done late on. "I thought he was really good. I thought he played with great pace and purpose and made really good decisions," Stevens said of Brown. "I didn't think anything was forced, where sometimes, when you come off the bench, that's one of the things, you try to catch up to the game quickly. He just played the right way and we needed our bench unit in the second quarter to give us a little bit of a lead. "Then it went back and forth and we were lucky enough to be up by 11 at half-time. But we were back and forth because we couldn't get stops for the longest time. "Finally, there, at the start of the fourth, we pushed it out a little bit and [Brown] was a big part of that."